How many times have you said something similar to yourself? Or are thinking why bother saving for retirement? But it can be hard to restart saving when there are so many other demands on your income. Here are a few reasons why getting back into a savings habit is good for you. “Pay yourself first” is one of the pillars of personal finance and considered a golden rule by many financial planners. The basic idea is simple. 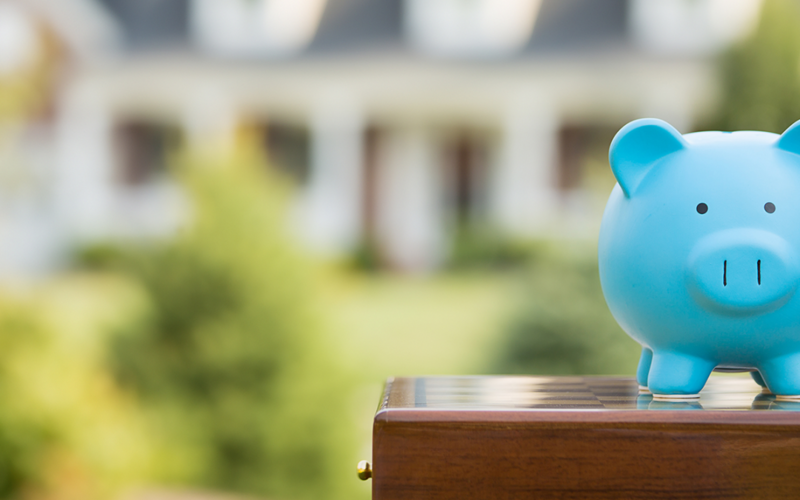 As soon as you get paid, put some of your pay into your savings account(s). You do this before you pay your bills or buy groceries. Paying yourself an amount that works for your budget is one of the easiest ways to get saving. Saving small amounts can make a big difference to getting ahead. It also has good physiological benefits. When you prioritise savings, you’re telling yourself your future is the most important thing to you, not that takeaway coffee. While money cannot buy happiness, it can provide peace of mind. By moving savings to the front of the queue, you’re able to set money aside before you rationalise ways to spend it. By making your savings automatic, chances are you won’t miss the money as it grows in its own separate accounts. You might put some of these savings into KiwiSaver for the long-term and some into another savings account for shorter term goals and unexpected financial bumps. 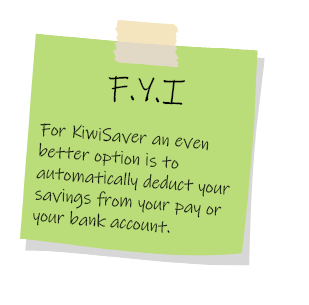 What money are you missing out on by not contributing to your KiwiSaver account? 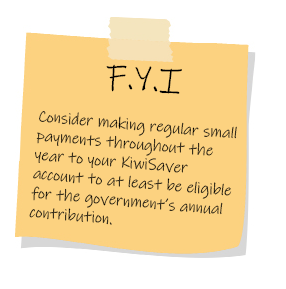 If you would struggle to meet your financial commitments if you restarted regular contributions from you pay to KiwiSaver, then consider making regular small payments throughout the year to be at least be eligible for the government’s annual contribution. You can still make these contributions direct to your KiwiSaver scheme provider while you are on a contribution holiday. You’ll need to contribute $1,042.86 (that’s about $20 a week) to qualify for the maximum government contribution of $521.23. You can also contribute less than this and still qualify for a lower government contribution. See more about this on our website. 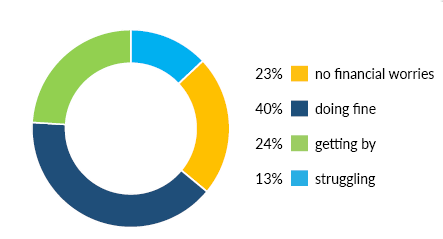 Most New Zealanders are confident in their ability to manage money but about 25% have no cash savings, according to recent ANZ research exploring the financial knowledge, attitudes and behaviours of adults in Australia and New Zealand. Starting to save, even a small amount, is one of the most important factors for people feeling higher financial wellbeing. To feel in control and satisfied with your current situation while having positive views and plans for your financial future. Financial wellbeing will be different for everyone. The research also showed financial wellbeing was not based solely on income or wealth but feelings and expectations about a current and future financial situation. People could have relatively high levels of financial wellbeing without necessarily having a high income, and vice-versa. What is consistently found in a variety of research on financial wellbeing is that the most important behaviours were active saving, not borrowing for everyday expenses and restrained spending. People are generally fitter and healthier in their 60’s and 70’s than the previous generation and more are keen to keep working longer. 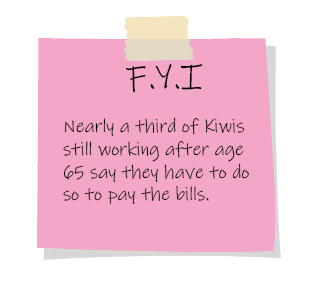 While many were still working because of the value and satisfaction it gave them, nearly a third of Kiwis still working after 65 say they have to do so to pay the bills. The government paid pension, New Zealand Superannuation, is $400.87 per week after tax for a single person living alone ($20,845.24 pa). There are different NZ Superannuation rates for your different living arrangement, go to the Ministry of Social Developments website for more information.